One expression of the renaissance of Māori identity and culture in the late 20th century was the emergence of Māori radio stations and a Māori television station. This poster is for Radio Waatea, a bilingual station set up in Auckland in 1999 to promote Māori language and culture to an urban audience. 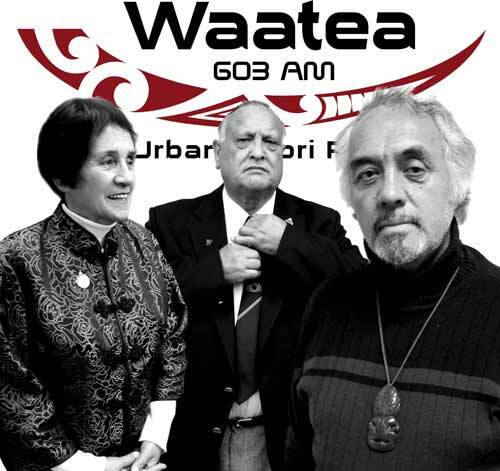 The poster features in the foreground three prominent Māori who host talkback on the station. They are (from left) Titewhai Harawira, a Māori activist; Jim Perry, principal of a kura kaupapa Māori (Māori language school) in Māngere; and Syd Jackson, whose protest career began with Ngā Tamatoa in the 1970s.